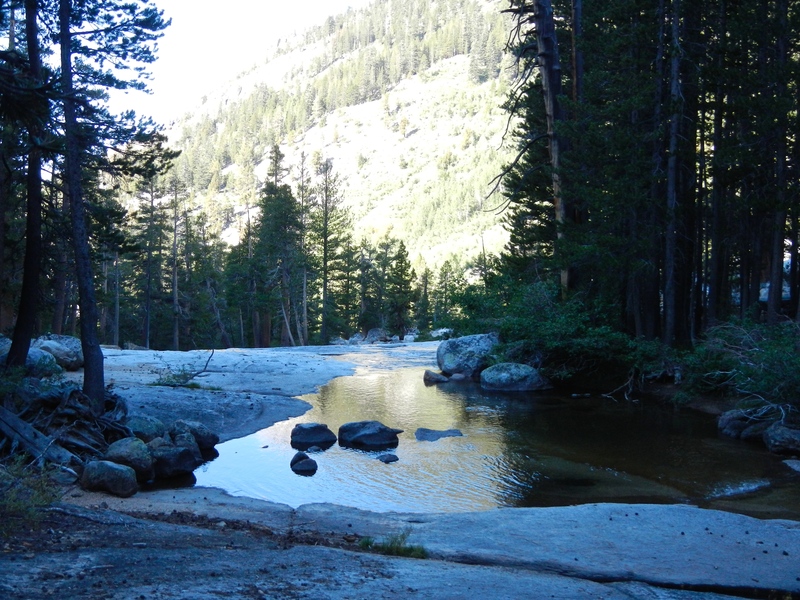 A long slog today–incredibly beautiful following Silver Pass Creek from our camp to where it spills over the edge of the little valley into the deep one below. 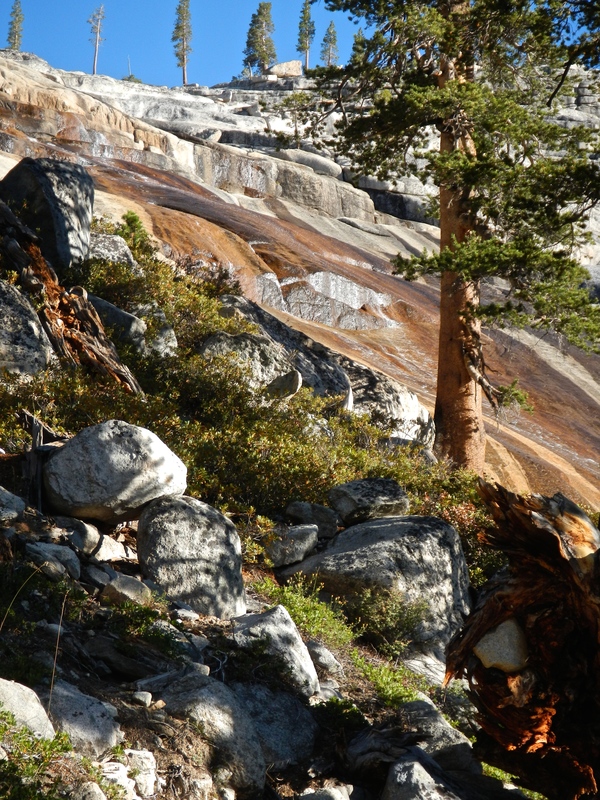 It cascades over the slick, glacier-polished granite into the dark forest. Looking downstream across the creek in the morning light. Silver Pass Creek gets ready for the Big Slide into the big valley. That’s some slick rock! 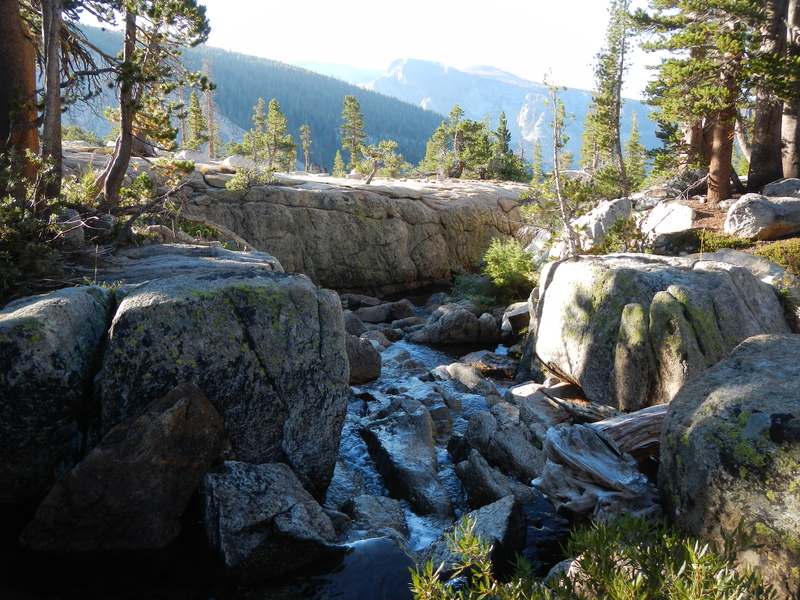 The creek spreads out over the granite and races down to the valley below. Mono Creek, still in deep shade. 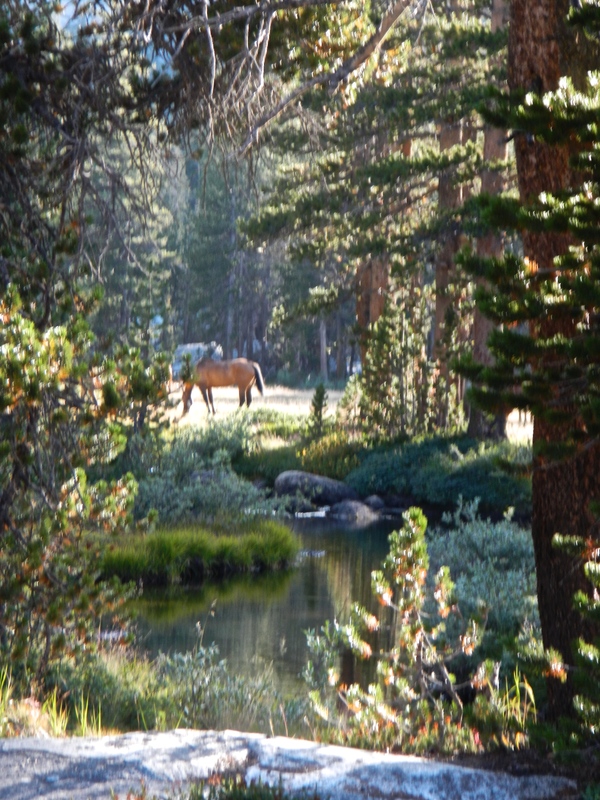 Walking down the long valley next to Mono Creek was very relaxing in the early morning. Everything was so peaceful, with the sun hitting the valley walls above us and leaving us in deep shade. Betty was hiking in her $5 Honduran Croc knock-offs (due to a slip while crossing Silver Pass Creek), and kept saying how that was the best $5 purchase she’d ever made. I want some! We skirted the end of Cascade Valley, which we had been walking alongside yesterday. I love being able to see the distances that we are traveling! Then a huge long uphill section through dry and dusty fir forests with many, many, many switchbacks called Bear Ridge. It was definitely a bear! One of the hardest climbs to date, not because of altitude or anything but the unrelenting toilsome climb. No vistas, an endless grade, a hot day, and frustrating glimpses of blue sky at what I’d think was the top of the grade, which we never seemed to actually reach. No water for 4.5 miles, which is the longest dry spell we have encountered so far. 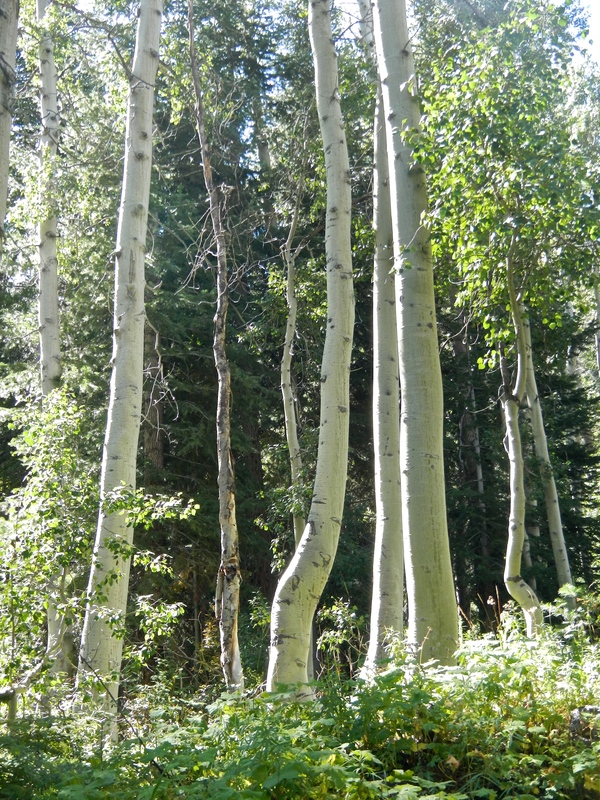 We passed through the largest stand of aspen yet on the trail. So light and airy! 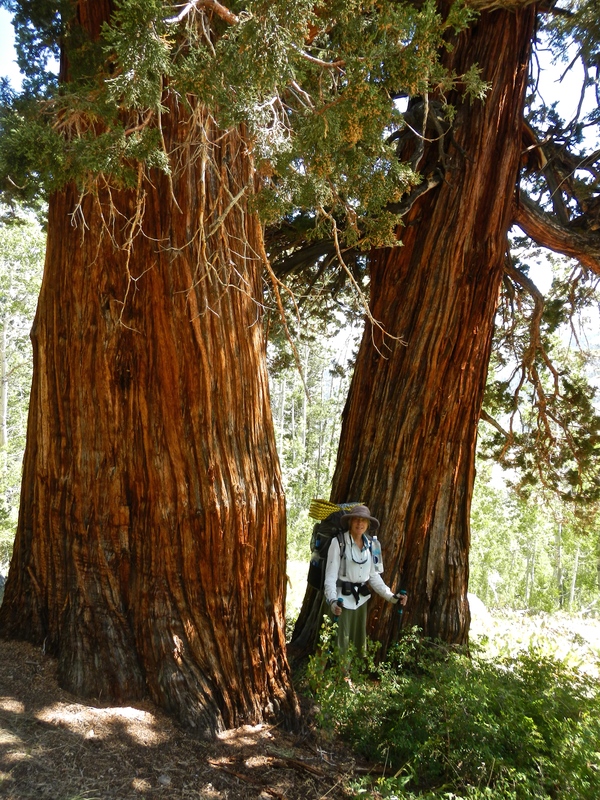 The trail led past these beautiful, huge mountain junipers. I couldn’t resist asking Betty to take my picture with them. Horses grazing in the late afternoon sun in lovely Rosemarie Meadow. At about 6:00 PM we arrived at Rosemarie Meadow, where there is a herd of horses pastured for the night, watched over by at least two cowboys. A very idyllic site, though I wanted to get well past them. Betty wanted to find camp right away, and she is probably right. I dreamt last night about Tony Rice. In my dream, he was looking good and healthy, and I was so pleased. I don’t think he’s ever visited my dreams before. We talked a bit. Then, on waking, I had “Manzanita” running through my head for miles and miles. There are worse tunes by far, and I have spent many miles with other less-desirable tunes. I won’t mention their names for fear of getting reinfected. 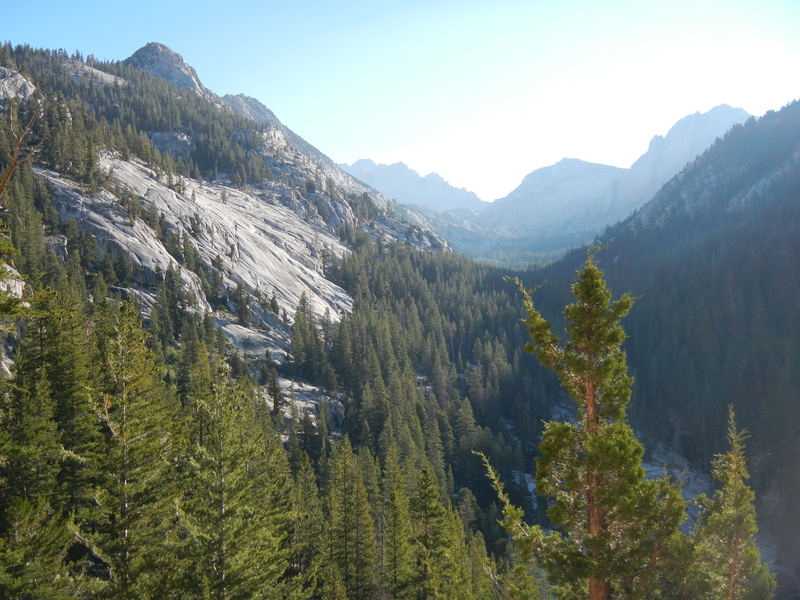 Looking up toward Mono Pass, which we didn’t have to cross. I spend long miles working on remembering or learning song lyrics. I have written some wordy songs lately, and really have to drill myself on the lyrics if I want them to stick. It’s one of the tasks that gets harder as I get older. So why do I write these long songs? The trail along Bear Creek towards the end of the day was really beautiful, but by that time, we were into getting a couple more miles before camp, and I didn’t even think of taking out my camera. Now I wish I had. Oh, well. I’ll have to go back there sometime. 14.5 miles today, and at 8:25 I am ready for bed. 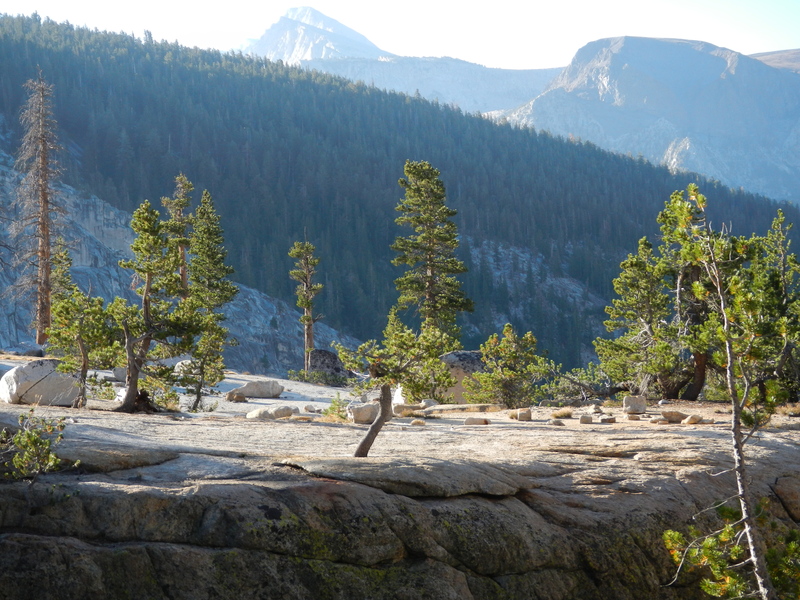 Early start to get over Selden Pass, which doesn’t look too hard from here–about 800’ elevation gain to the top and then about 7 miles to Muir Trail Ranch, with showers, hot springs, laundry and dinner. The creek that I put my foot in. 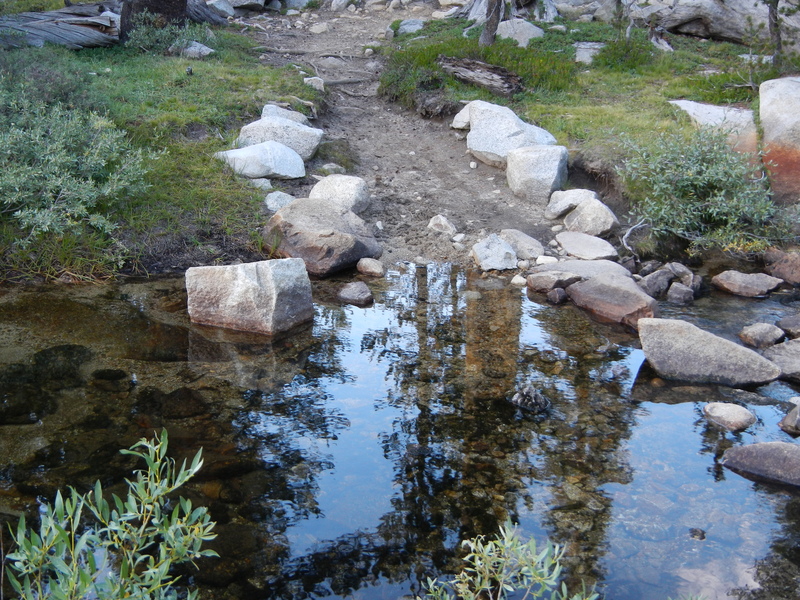 I love the stream crossings, which in this drought year are pretty easy. I delight in my agility as I balance from rock to rock. This evening, I stepped on a tippy one and put my foot in the stream. Too much inner-gloating going on! I’m so enjoying this blog, Laurie! Beautiful photos. 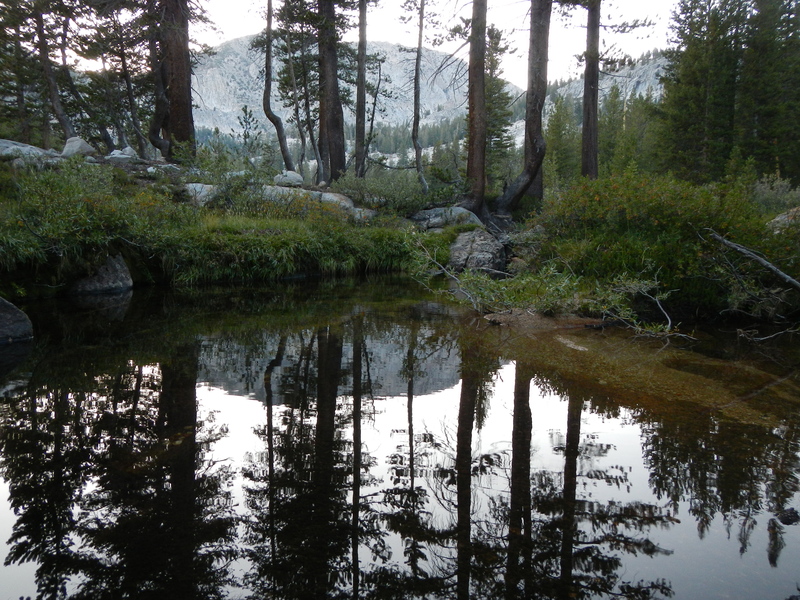 All your beautiful pictures make my heart sing and yearn for the high country. Thanks!